One of the more popular flowering plants around the holidays is the Schlumbergera bridgesii better known as the Christmas cactus. It offers a profusion of tubular flowers that bloom for two to four weeks around Christmas time. This jungle cactus is an epiphyte lives on trees and is different from the desert cactus in that it is the trailing type and does not require direct sunlight. Which type of Schlumbergera you have? Christmas cactus has flattened leaves with scallop-edged margins that are smooth and spineless with tubular 3 inch flowers. Thanksgiving cactus (Zygocactus truncates)(S. truncatus) crab cactus, which has sharply toothed edges with two large teeth at the end of the last joint on each branch and shorter tubular flowers with spreading pointed petals. Easter cactus (Rhipsalidopsis gaertneri) grows more upright, has fibrous hairs at the joints and produces different flowers. It is the more difficult to grow. All bloom close to their respective holidays under normal growing conditions. Not only are these cacti so popular because of their spectacular blooming habit but also because they are relatively easy to care for. They require a rich, well drained soil, bright indirect light and a daytime temperature of 70 degrees and night temperature of 60-65. Feed it with a balanced houseplant fertilizer between April and October. Christmas cactus is not drought tolerant. Water the plants thoroughly and let them dry out between watering. Do not ignore it or kill it with kindness. The leaves will wrinkle if the soil is too dry or when over watered which can lead to root rot. Water less in the winter. When the flower buds begin to show, place the plant in bright light and temperatures (60-70F). The plant will no longer require long nights and cooler temperatures. Once the flower buds are formed, try not to move the plant to a different location as it may cause the buds to drop. When in bloom keep the plant moderately moist (not too wet). If the leaves get limp and flabby you may be overwatering the plant. Too much light can fade the flowers. Do not expose them to direct heat, cold drafts. Fertilize lightly with a high potassium fertilizer when the buds form and continue until the flowers fade. When the plant is finished blooming withhold water for 6 weeks allowing it to rest. After bloom or in spring/summer, prune the plant by pinching off sections at the joints to promote branching. Pruned sections can be easily rooted. In early spring, when new growth starts to show, resume feeding and watering. Move the plant outdoors in a shady spot for the summer. Give your Christmas cactus a little love and care and it will flourish for years. Some do so well that they have been known to be passed down in families for generations. The stem cuttings can be rooted in potting soil mix and started as new plants. I am so glad I found this web site-have Christmas cactus 3rd generation off an original plant that was 105 years old.have been passing down generation to generation. Was concerned about the woody stems and you answered my question..Thank you so much!!!! I HAVE A YELLOW BLOOMING CHRISTMAS CACTUS THAT THE LEAVES HAVE STARTED BECOMING LIMP AND ARE BREAKING OF AT THE SOIL LINE. MY QUESTION IS…WHAT IS CAUSING THIS AND HOW DO I FIX THE PROBLEM? From you description, your Christmas cactus has a type of stem rot caused by either a fungus (Fusarium oxysporum)basal stem rot or a bacteria (Erwinia spp.). Both start at the soil line and work their way up and cause the stems to drop off. It usually starts in overly wet soil and will eventually kill the plant. Not a lot you can do but to remove any diseased parts and reduce watering. It may recover on its own. Take cuttings and root to make new plants. My zygo cactus has leaves at the base of the plant that are covered with a scale-like covering that is tan in color and can be removed by running my thumb nail under it.The leaf under the scale is still green, but I’m afraid it will die soon if the scale isn’t removed. It’s much too large for me to remove all the scale leaf by leaf. Please help me determine what has caused the scaling and how to get rid of it. Thanks very much! my Christmas cactus leaves has turned a dark purple. It is probably 6 years old. The purple leaves can be a sign of a mineral deficiency such as phosphorous or manganese. It may need a fertilizer that supplies both major nutrients as well as trace minerals. My Christmas cactus always blooms just before Easter, in fact it is blooming now. I a put it outside in the summer, bring it in before a frost and put it in my basement. If I bring it upstairs and put it in an East facing window it still wont bloom until Easter. It looks like the Christmas cactus not the Easter cactus. Should I put it in a different window to make it bloom sooner? Some plants do their own thing. 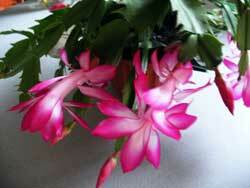 As you can see from the questions, there are Christmas cactus that bloom several times a year. Mine is blooming for the second time-right now. It needs either cold night temps (55-59F for a month) or 12 hours of darkness for 5-6 wks to initiate bloom. One thing you can try. Move the plant in the house instead of the basement. You really don’t need to put it in the basement when you bring it indoors. By that time, the flower buds should already be initiated. I keep my plant on a porch where it does get the longer cooler nights in the fall. When I bring it inside in Oct. (before a frost), I see tiny buds started. It usually blooms by Thanksgiving. My mother has had a little christmas cactus for many years, but the poor thing’s been a bit neglected. It’s dry looking, the soil is hard, and hasn’t bloomed in quite a while. My mother thinks we should move it to a larger pot, but what I’ve been reading about is unclear on how/why to do such. Any tips on how to get this poor thing lively again? Thank you! I have two questions. Why has my Christmas cactus bloomed three times. First at Thanksgiving, again at Christmas and now it is blooming again?I also have two citrus plants that are growing tall. Do I prune them and how do I do it? What is the best place for them? They are in a north facing window. Christmas cactus can bloom more than once a season when conditions are right. Mine is also blooming for a second time. You can prune your citrus plant in spring by 1/3. Leave some green wood. Also, occassionaly prune during the growing season to shape the plant. If needed also transplant them at the same time. They need high light to grow well. Low light will produce leggy growth. Keep them in the brightest window in the house (South). In spring, when you see new growth, start feeding your plant with an acid fertilizer. If you can, move the plant outside for the summer. I have a Christmas Cactus for many years its the size of a busloomshell basket, but since I have moved 6 years ago it has never bloomed! I use to get about 50 flowers but now none. Whats up???? Is it getting all the requirements to stimulate bloom? 1. Long nights â€“ Christmas cactus requires at least 14 hours of darkness for 5-6 weeks. 2. Prolonged cool temperatures of 50-55F degrees for 6 weeks. If kept at 55F, some Christmas cacti will bloom regardless of daylength. Bud formation will not happen if temperatures are above 70 degrees. If the plant is healthy, then it should bloom. Once the blooms start to die can I pinch them off? Or should I just leave them alone? The plant doesn’t look very good with the dying blooms on it. Thanks for any help! Yes, you can gently pinch off the dried up blooms. They will eventually fall off by themselves. my christmas cactus plant -one of the branches is laying down . The branches can break of at the soil line due to some kind of problem, such as stem or root rot. The best thing you can do is to take the branch and repot it in fresh soil. My cactus used to be really healthy, then I moved & it was replanted by my rather let me say careless brother, but regardless of that, I think it has some kind of infection or something, because it doesn’t look right. It used to have fully green leaves & roots. Now its leaves have spots in certain areas and certain roots have these brownish, greyish looking stripe-type formations along them. The poor plant looks rough compared to how it used to. If you didn’t know better it would look fine. But upon closer inspection it just looks “off”. I wish I could find some pictures to compare it with so that I could find the exact infection & proper treatment. Do you know of any such sources? We are getting leaf drop from our Christmas Cactus, not bud drop. They either shrivel up at the base or just separate at the base. What could be possible problems causing this to happen? It may be stress related-usually water related. A change in the environment, too much water, dry heat can cause leaf drop. Keep it away from heating vents or cold drafts. If there is discoloration at the base, then it can be a stem rot or a canker caused by a fungus or bacteria. Save the “dropped” segments and root them in water or plant them in fresh sterile soil. I thought I would share that I have a 10 year old plant that is very happy. It was a branch from my mom’s plant. It is on a stand in front of a east-facing window and I live in Michigan. It blooms nearly every 2 months throughout the year. It always blooms 1 week before Thanksgiving and before Christmas. It ocasionally blooms in January, but it usually blooms in February, near Valentine’s Day, then again in April for Easter. It tends to go dormant for the summer. I give it a “big drink” where the entire pot is filled, once or twice a year (in the spring and end of summer). Since it is over 3′ across I have to do this outside when the weather is nice so the water does not drain all over the house. The rest of the year I just give it a daily glass of water and about 4x a year, it gets fertilizer. I also repot it once a year, although I do not plan to repot it for the next few years, because I got a very large pot last year for it to grow into. I am not sure I will be able to find a pot any bigger than the one it is in now. Plus, it is so heavy. I hope this helps other people with their plants. Thanks Susan for your input. You and your plant live in harmony. My Mom passed away in Feb. 2010. She had a huge Christmas cactus that she had nurtured. I didn’t have room for the plant but I snipped a piece off and planted it. It was just a single stem….no Y section. It has grown another long section in almost a year…..not much. How do I get it to spread into more than that one stem? Thank you. One piece will take longer to spread. Usually, a 4″ potted plant will have 3 single stems in it to fill the pot. Once your cutting has at least 3 sections you can trim one in late winter to encourage a Y section. One of my cacti got a bit dried out, my fault and I am sick about it. It continues to be limp and sad looking. Anything I should be doing but watering it normally? Continue to water but don’t overcompensate, keep it slightly dry. Christmas cactus needs a dry, cool period during the winter. It should perk up in spring. I have a large Christmas cactus which has just bloomed. I live in Pennsylvania from June to January then go south to Naples, Florida from the beginning of January til June. I would like to take the cactus to Florida and hang it outside in the shade of a tree. I’m concerned about the heat as it gets into the high 80s come March/April. Will that hurt it? Christmas cactus tolerates temperatures in the 80’s and higher. It will adjust to the temperature change. I would love some advice on timing after the holiday blooming season. Do I withhold water entirely for 6 weeks or just water lightly? Also, my plant sometimes blooms twice. Should I wait for the second bloom before the dry period? Last, when do I pinch? Before the dry period? Immediately after? A few weeks after? Thanks so much for all the helpful information on this site! Once the plant is done blooming, keep it on the dry side. Do not withhold water entirely just water it less by 1/2. You should wait for the second bloom to finish before the dry period. Pruning/pinching the plant is done to keep the plant full and bushy but it is not necessary. You can prune/pinch Christmas cactus after its done blooming, after the dry period or in the spring before new growth. I usually cut off the flimsy/weak growth in the spring before the flush of new growth emerges. They can also be pruned during the summer months. i have an easter cactus that has amazingly survived over 8 years of neglect, too much care, and more neglect. it was a gift for when my husband and i opened our retail store, and stayed at the store for until we closed it in april. for about 4 months, it lived in our warehouse, and then home, where it didn’t get much care, or light, cos we’re never home. i brought it to work about 3 weeks ago to try to save the sorry thing. it had been been doing OK, and i looked up proper care for the plant. i’ve been watering it only when the soil was pretty dry. watered it till water came out of the pot, and let it drain out. been keeping it under the fluorescent lights of my desk. i live in denver, and it’s extremely dry here, and no humidity, so i’ve kept to a weekly schedule. but, i do check to make sure the top inch or so is dry. it hadn’t grown any new leaves yet, but at least it started to look healthier. now, i noticed today that it’s got these little depressions in the leaves. they don’t go all the way through, and they’re really tiny, like the head of a pin, or smaller. some aren’t any different color than the leaves, some are kinda brownish. am i over-watering it? am i killing it? help! as much as i’ve neglected it, the plant means a lot to me. Now you’re killing it with kindness. You may be watering your Christmas cactus too much. The depression in the leaves will eventually turn into a brown corky growth is a symptom of edema . This environmental condition happens when the plant is overwatered. The water moves rapidly up to the leaves but the plant canâ€™t transpire it fast enough causing the cells to burst. The broken cells heal over and develop corky brown spots. I need help with a newly aquired Christmas Cactus. My mom just gave me her MUCH beloved Christmas Cactus – I’m not sure of age, but it is average sized with tons of flowers. My issues are these – the plant at her house was SO healhty – now they are turning a lighter color green (not all of them) and seem wilty. The soil it is in and has BEEN in is just dirt from outside and it is really hard! But, it must like it as it has been doing well for years. My mom has “city” water, we have well water (tested it is wonderful water!) and my mom’s house is a constant temp. She kept it outside under shelter all summer and brought it inside to bloom. It travelled over an hour by car (with buds and blooms!) and I have moved it several times trying to find a spot for it! I had it on my dining table, but we have a woodstove and temps go from HOT to chilly, nothing steady (can get up to 80!) and the sun was shining on it one afternoon and i noticed it did not look happy, so moved it over out of direct sun. Then i read it needs cooler temps, so i have it in a window that gets very early morning sun only and a steady day temp of around 66 and night temp around 64. Should i repot after the holidays? or should i let it stay in its soil since it does not seem to mind? Did it start to wilt because of the sun and will just take time to recover? Should i keep it where it is now in the window without direct hot sun and cooler temps?Thanks so much!! You don’t mention if this is an older Christmas cactus. They usually don’t take well to repotting. If you do decide to repot, do so in early spring. The wilting may have been a watering issue, either too wet or too dry. Keep the plant moist not wet) during bloom and once it is done blooming maintain it on the dry side during the winter. The current window placement sounds fine. Your plant will eventually let you know if it is good. Once established they really aren’t that fussy. Eventhough, they are called Christmas cactus, most will bloom around Thanksgiving. Good luck with your new plant. i have a thanksgiving cactus,i brought in the house this fall,i keep it out in the summer.now we have fungus gnats in the house from it,how can i safely get rid of this problem? See http://hortchat.com/info/fungus-gnats for treatment ideas. I have a big red and pink (yes, the store must have planted two different plants in one pot) Christmas cactus from 10 years ago. It often will have a number of blooms a month or two after its initial full bloom. Should I keep the plant a little more moist after the first bloom and maybe feed it once to see if I can get more blooms the second time? Or is that not recommended? Thanks for your help, these posts have been more informative. I keep the plant outside in the shade all summer and take it in after the buds have come out, but before frost. It blooms like crazy just before Thanksgiving. Once you know what your Christmas cactus needs, its easy to care for them. You can try feeding it after the initial bloom with a 1/2 dose fertilizer and see if you get more flowers. They usually bloom less the second time around. The recommendations is to stop fertilizing during bud formation but once the flower buds form keep it moist and fertilize with a weak formula. Be careful not to overwater or keep the plant too wet. I have had a Christmas Cactus in an 8-inch pot for over 20 years – it was doing fine until a couple of years ago. At that time, it started a cycle of dropping all it’s leaves and then just when I thought it was dead, it would develop new growth. It is in a cycle of regrowth right now. The plant consists of three woody stems (4 to 6-inches in length and firm) and a couple of new stem shoots coming out of the soil (1 to 2-inch) with 3 to ten new leaves (healthy looking) sprouting out of each stem/branch. I recently found tiny flies on the plant which I have been treating with Safer Houseplant Insect Killing Soap, which kills on contact. I am not sure if this has been the problem all along, as I never suspected or looked for insects. This plant has a lot of sentimental value and I want to do everything I can to keep it alive. I am worried it will start losing leaves again. Any advice? Also, it’s never been more than a foot or so in diameter. Does it need to be re-potted? Is that risky? If you recommend that, when would be the best time to do it, considering this plant’s history? The tiny flies (fungus gnats) tell me that the soil may have been kept too wet. Let it dry out slightly between waterings and keep the plant on the dry side during the winter after it is done blooming. In the spring- prune the plant lightly and when new growth shows, start to lightly fertilize. This will stimulate new fuller growth. I would not repot the plant, it is risky. It seems that older Christmas cactus do not respond well to repotting. If necessary, carefully repot in early spring. Okay one more question…I desperately do not want to mess this up, as my cactus is the first to produce a seed pod in its family and everyone is pretty excited about it. The seed pod fell off, I let the seeds dry on a paper towel. I bought seedling mix. Do I just plant all the seeds in the same pot or is there a better way to do this? I just want to make sure I do this the right way. Thanks! Okay, so my cactus has a seed pod. What do I do with it? I read that it dries up and falls off on its own and then you plant the seeds. Is that how it goes? Yes, the attractive fruit is 1â€³ long and should remain on the plant for a year. After which, you can pick it and squeeze out the jelly of seeds and let them dry on a paper towel for a few days. Then you can plant the seeds in a seedling mix to produce new plants. I have a Christmas Cactus that I bought this past Christmas and it “came with” the start of many blooms. When I brought it home the buds died off within a few days. I suppose I put it into shock since it was a very cold winter day here in NY. My fault! Now it is summer and it has been placed in my kitchen and relocated a few times, but the temp. has been consistent (pretty warm) and the lighting moderate as it is hot here and the blinds and curtains are down. I recently read that I should have fertilized the poor thing and I may be overwatering, too. So, here are my problems: stems are rapidly falling off (however, I have re-rooted some in another pot with another one root xmas cactus and they are establishing); leaves are becoming wrinkled, wilted and falling off; the soil is moist, yet dense; base roots look brownish and feel a little mushy to the touch. I know nothing about a Christmas Cactus and today is the day that I decided to educate myself. It took me a very long time to finally find one of these plants (in Lowes in a hanging basket!) and I want to keep it. Please help me try and save my pink beauty. Thank you very much. Christmas cactus are easy to care for once you know what it is that they need. I think sometimes you can kill them with kindness. It sounds as if it could use more light. If the soil is wet and the stems are wrinkled, then you are overwatering it. Make sure that the soil drains well when you water and let the top 1-2 inches of soil dry before you water again. Err on the side of less than more. If possible, place the plant outdoors in a semi-shaded area for the summer. They need more water in summer when actively growing and less in the winter when dormant. Hopefully, it will recover soon. Help, I fertilized my christmas catcus and now the leaves are limp and white. I used a different fertilizer than I had in the past. What can I do? Can I save the cactus? I’m not sure it was the fertilizer. Is the plant in direct sun? Too much sun exposure will “bleach” the stems. If the foliage turns a dull gray/green color and wilts, then you may have a pythium rot (stem rot) wich will cause stem drop. At any rate, to get rid of the fertilizer, try leaching it out of the soil by watering the plant several times and let the water run out of the bottom of the pot. Then let the plant dry out for a few days. I have been watering it this morning and some green has returned, but I don’t know if I just keep watering it, how much, or if I should give it any fertilizer. It is about two to three months old. I’m hoping you can help me- I’ve been entrusted to save a 100+ yr old zygo. Apparently it was doing really well, then the owner decided to repot to a larger container and at the same time divide the stems. Since then it has been going downhill. As I didn’t see plant prior to getting it, I’m working blind. I’m good with plants, but not too familiar with zygo’s. Would you please take a look and let me know if there’s anything else I can be doing? First off, it has fungus gnats, which I know how to get rid of. Second, it seems overly wet, but the stems don’t feel mushy so I think it’s caught in time and needs to dry out a bit. Third, it seemed to be planted to deep- the top 2″ of soil was really loose & seemed high up on the stems, so I removed the extra soil (just started to get to the roots). As I was removing the loose soil, I picked out several dead stems- they weren’t mushy, just kind of hard and woody. I think that will help the fungus gnats and wet soil. Fourth, the leaves are droopy & wilty (which seems to be from overwatering), but the stems seem to be pretty good. How deep should zygo’s be planted? I’m debating on repotting to a smaller pot, carefully removing the excess soil around the perimeter, but I’m not sure if that will do more harm than good. A smaller pot will keep it root bound and decrease the amount of water-retaining soil (it was planted in regular potting soil), but I don’t want to stress it any more than needed. I’m thiking about including SuperThrive in the next watering (not a fertilizer, a vitamin-hormone additive) and holding off on fertilizer for awhile as the leaves are still a dark green. At this point, I’m kind of just waiting to see how it goes, but wanted your opinion on what I’ve done so far. I appreciate any feedback you can give. I need some tips to permanently get rid of fungus gnats please. See fungus gnat article for suggestions. I was given an Easter cactus earlier this year which bloomed wonderfully, I kept it on the windowsill. Now the temperatures where I live have rocketed (a dry 28-35Â°c) and every day I find two or three leaves have fallen off the plant. I have moved the plant away from the windowsill but still find leaves dropping off. The soil is moderately moist and the stems are all upright? Is this ok? should I move the plant to a shady spot on the terrace? Do I need to mist to increase humidity? Yes, move your plant to a shadier spot to protect it from the heat and sun. You don’t need to mist if you have humid weather in your area. Hello. I have a small Christmas cactus that I purchases last year. The plant was in full bloom when I purchased it. I have kept it in the bathroom for over a year. Minimal waterings, indirect sunlight. I was caring for all my plants at the same time yesterday and accidently placed it outside with others. Don’t ask….I wasn’t thinking. Got home from work today and went outside to check on things. The top leaves are white, lime green from over exposure. What should I do? For now, I put it in a back closet in total darkness. Should I put it back in the bathroom? I don’t want it to die! Thanks. Total darkness won’t help, put it back in the bathroom. Depending on the severity, the leaves will retain the sunburn damage, some will recover but it should not kill the plant. I have a 50+ year-old Christmas Cactus. The stems are woody. Can you actually break up the root ball and transplant them into several pots or must one just take cuttings and repot? Dividing the rootball of an old fragile cactus can be risky as it is difficult to handle and recovery is much slower if at all. You may loose the plant. Probably not a good idea. Some have had success dividing younger plants. Propagating from cuttings is the easier and safer way to go. Thanks, the bugs do not fly and are in the soil, barely visable. I just noticed in my spider plant as well. I’m a little freaked about the bugs in the house/infecting other plants. Sadly, do I disgard the plants and start over, or how do I kill these bugs? Fungus gnat are 1/4″ white larvae that turn into a small flying insect. There is another insect that can affect Christmas cactus – root mealy bugs, tiny insects that cause chlorosis of shoots and weaken the plant. http://www.umass.edu/umext/floriculture/fact_sheets/specific_crops/cacti.html If it is root mealy bug, it is best to take some cuttings and discard the plant. Last year I babysat two of my mom’s christmas cacti. She said their leaves were just falling off w/ no signs of illness or infestation, so I kept them away from my plants. One day my husband (in a misguided attempt at helpfulness) put them with my plants! Three of mine died from the same problem. One, which we got when my son was a baby (and is now 18yrs old) started growing new leaves–I was thrilled it had not died! But now the leaves are simply falling off again. I do not overwater it. What could the problem be and how can I save this special plant! It’s difficult to say exactly what is happening to your Christmas cactus. Are the stems disscolored? It may be stem rot caused by a fungus. http://mrec.ifas.ufl.edu/fdacs/Cir174.htm see if that fits your problem. Hi, I have been caring for an inherited chrismas cactus for about 2 yrs now. After reading this post, I’m better informed and remember seeing a reddish rim around the leaves when we had in direct sun. The plant did bloom last year, not this year, it had wilted leaves (which I suspect I had overwatered) now the leaves are green, sections do fall off at times, it has firm woody stems. New growth started, but today I noticed very tiny white bugs, there is no cotton like appearance of anyting. I’m confused about the woody stems, new growth and bugs…is it healthy? Or a goner? Thank you! The woody stems develop as the plant matures. New growth usually occurs in spring and if it gets too leggy (long) you can trim a section to encourage fuller growth. I’m not sure what the tiny bugs are. Do they fly? are they in the soil? Hi There, I have a large, usually beautiful, often flowering, approximately 15 yr old cactus that is about 3′ in diameter. I live on a boat and it has always been happy and growing in many different climates until just last week when it began drooping and the leaves turning a purplish-red color. I am tempted to cut it back. I love this plant and can’t stand to see it droopy. A purplish color can indicate a nutrient deficiency such as phosphorous or manganese. When the plant shows signs of new growth, feed your plant with a balanced fertilizer that includes minor elements. Spring is a good time to prune your Christmas cactus. It will help produce a bushier plant. Discloration and wilting can also be a sign of root or stem rot problems. I purchased a Christmas Cactus right before Christmas and all of the flowers fell off. I think that was due to the change in temperature and humidity. Since then I have fertilized it with a 10-10-10 mix in February and now I am waiting for new growth. Can you tell me the first signs of new growth on the plant? I have not seen any new segments yet. I water it only when the top inch or so of the soil is dry, I am trying not to over water it yet trying not to let it dry out, which is quite tricky! Anyways, when can I expect new segments to grow? or do I need to snip off segments and repropagate them? The plant should send out new growth within the next few months. It may be slower to put on new growth when it is stressed for some reason. When watering, another way to tell if it needs water is to lift the pot, if it is light then water thoroughly and allow it to drain from the bottom. Wait until the pot is light again before you water again. Skip the fertilizer for now, it is of no use when the plant is not growing. Wait until you see new growth. Hey there! We have a beautiful Christmas cactus that we inherited about 9 years ago. It is kept year round in an eastern exposure. We live in South Carolina, so the “change” in seasonal temperatures aren’t very grand. However, as soon as the temps in the fall start to turn cooler, I place the plant outside, on the covered porch, until close to the beginning of December, when the leaves are budding. Every Christmas, we enjoy beautiful blooms. However, this year, right now exactly (March 14, 2010), the cactus (which has been inside since Christmas) is blooming again!!! We are certain it is a Christmas cactus because it has the prickly sharp leaves. It has never done this before. We have never cross pollinated (or any kind of pollinated, though we would like to learn), and it is the only cactus that we have. Is this common? I can’t find where it has happened before. Thank you for your comments in advance. I enjoy reading what the others have written. my christmas cactus has ONE bloom (march10) . the rest of the plant is somewhat firm in places, then somewhat limp in others. also when do you stop watering altogether, and store it in a cool dark place(and for how long)? also, would it be a good idea to mist it every day? You don’t need to store your Christmas cactus in a dark place just keep it where it is and slow down on the watering to allow a dry dormant period. This happens during the winter after bloom. Now that spring is approaching, water the plant as usual (when top 1 inch is dry). The cool period with 14hrs. dark starts around September to initiate bloom. I keep my plant outdoors until early fall and then the plant is ready to set flower buds. because it naturally gets longer nights and cooler temperatures. Misting the plant won’t make too much difference. My cactus is dying from root rot due to over watering. (I over loved it) I salvaged what could but it wasnt in the best shape. I took some clippings let then dry out for an hour replanted them and gave them a good dose of water. That was a week ago and I havent watered them since. There indoors, have indirect light and a avg temp of 68 degrees. When I cut them, they were thin and had purple around the edges with little dark spots. They had strange little hairs on the ends of the stems and roots growing in between the segments. They have perked up a little but there still pretty thin. I believe only time will tell. In the mean time is there anything more I can do to save my plants little life? Pease HELP me, my brown thumb and my little cactus. It has so much sentimental value. You are doing everything that you can at this time. It will take some time for your cuttings to perk up. Make sure they are in good, well-drained soil. Now that its’s spring, don’t let the soil dry out completely and once you see new growth, lightly feed the plant. Hopefully, the purplish coloration is a nutrient deficiency that will eventually correct itself. I have a christmas about 16 years old. it is very healthy and has been transplanted several times,it started to budding in late November then flowered in time for Christmas and has been continualy budding and flowering going on 3 months. It is located so that it gets the early AM and PM sun. Is this normal and how long should I allow this to continue? Christmas cactus can bloom more than once in a season. Yours sounds like an unusual case, you must be doing something right. The plant will stop blooming when its done. Enjoy!! I have a Christmas Cactus that I inherited from my Grandmother. She had it for as long as I can remember (20+ years). When she passed away, I repotted it and it started growing even larger. That was nearly 3 years ago. The plant has been growning and the leaves all look good, but it has not bloomed since it has been repotted. Them stems appear to be very mature (have the bark liked stems on each one coming out of the pot), but recently my christmas cactus has started to look droopy (and still hasn’t bloomed). Why hasn’t it bloomed in 3 years? Also, I had my cactus sitting next to a orchid which I just discovered had mealy bugs (adults I think). My cactus had a few joints that had a “cotton” looking substance on them. I wiped them off with rubbing alcohol wipes, but should I spray my whole plant?? Will that kill it? This plant is very important to me, please help. It sounds like the problem started just after you repotted the plant. Here are some ideas to consider. 1.What kind of soil did you use? Did it have a fertilizer in it? Are you fertilizing the plant? Christmas cactus do not require lots of food and too much will make them grow but not bloom. 2.Is the plant in the same location before transplanting? or did you move it to another place? Christmas cactus requires at least 14 hours of darkness for 5-6 weeks to bloom or prolonged cool temperatures of 50-55 degrees for 6 weeks. If kept at 55F, some Christmas cacti will bloom regardless of daylength. Wilting can be a sign of over or under watering. Be careful not to overwater the plant. They require little water during the winter. The alcohol wipe may solve the problem. I would isolate each plant so that they don’t keep reinfesting. Keep an eye on the mealy bug and be vigilant in treating it with alcohol. If after a month it doesn’t go away, then consider spraying. Hope this helps. for more info see above article. I have a christmas cactus that is about 30 yrs old and several smaller plants that were originally cuttings from the first plant. They have all been doing well. The plants are all in the same places they have been for years, under the front and rear porch overhangs of my home. Both plants in front and rear of house are developing woody looking growths at the junctions of the leaves. These are not solid but lots of small pieces. I took it to the local nursery and he thought it might be some type of “cancer”. Any help will be greatly appreciated. Like so many others, these plants have a lot of sentimental value and I hate to loose them. It may be some type of stem canker caused by a fungus. The stem will have soft brown or sunken areas and sections of the stems fall off. It can eventually kill the plant. Once the plant has a fungal infection it cannot be elliminated but can be control with a fungicide treatment. Be careful when watering. Do not keep the plant too wet especially during the cold winter season. Also keep in mind if the plant is generally healthy, some of the woody growth can be a naturaly aging of the stems.. To be on the safe side, I suggest that you take some stem cuttings in the spring and root them for new plants. I have a very old Christmas cactus. It has been a very reliable bloomer for the twenty years I have owned it. I bought it at a garden sale and it hs lived in several homes with our family. We were recently away for the holidays and came home to find that our furnace had gone out and our inside temperature was 31 degrees. Not all of our houseplants survived. The Christmas cactus looks untouched by the cold, but I notice that most of the segments are speckled with a rusty-colored scale that brushes of easily. What is this ansd how do I treat it? It sounds as if your Christmas cactus was injured by the cold temperatures. The plant tissue was damaged and is turning brown and flaking off. It will callus and leave a scar. There is nothing you can do about this. The plant will be fine as long as the leaf tips are healthy. Another possibility could be scale. This insect shows up as round bumps on the surface of the stem which can be scraped off. In winter, Christmas cactus goes into a “dormant” stage and does not require much water and should be kept dry and cool. If the soil is wet and the plant is drooping then it is too wet and may have some root damage. The plant needs to dry out. If the plant is wilting because the soil is dry, give it a good watering and wait a month or more before you water again. In late winter, early spring, trim back the plant-up to two segments, especially any thin, wilted stems. This will promote new, bushier stem growth. I was gifted a cactus recently…repotted, seemed happy…when I got it just the tip of every stalk was dead, brown, dried up. I pinched off every dead bract, now the ones that were not pinched off are in bud, but the tips are still starting to brown. Never had this happen before. Any thoughts? Several factors can cause browning tips. 1. check for insects -spider mites, they like to feed on terminal growth. 2. Check the roots. Are they growing in a circle? The plant could be potbound causing poor drainage and water absorbtion. 3. Fertilizer- are you feeding the plant? Christmas cactus need little fertilizer. Too much fertilizer can cause an accumulation of fertilizer(soluble salts) and burn the plant tips. You can flush out the soluble salts by running water through the soil and letting it drain out from the bottom. Hope this will help solve the problem. side and once inside! These cactus are about 3 years old. I recently received a Christmas cactus as a gift. I keep the soil moist, watering every other day or so. The plan does not receive direct natural sunlight but does get plenty of full darkness at night.The majority of the plant has already bloomed. How long should the flowers typically last? Mine stay fresh for a couple of days and then start to wilt. Is this normal? If so, is it recommended to pinch off the dead, wilting flowers or should I leave them be? Thank you so much for your help! Your Christmas cactus should bloom for 2-3 weeks. The flowers will last longer in cooler temperatures. Any type of drafts from cold or heat as well as improper watering will shorten the lifespan. I would suggest that you try to water less often. Keep the plant moist by giving it a good soaking so that all the roots get watered and then wait until the top inch is dry before watering again. The plant uses less water in cooler temperatures and lower light conditions. Once the flower buds start to show, Christmas cactus like Poinsettias can be moved to bright indirect light and normal room temperatues 60-70F. It doesn’t need 14 hrs. of darkness. It is better not to move the plant when the buds have already formed, as that can cause them to drop. To clean up the plant, pinch off the dried flowers otherwise they will eventually fall off. My christmas cactus looks terrible, was doing great and full of flowers. Now the stems have wilted, drooped and have turned a dark color and wrinkled and soft. Can I save it, and how. Why did this happen? Would like to know so it doesnt happen again. Did you move the plant? How was the watering? Is the soil dry or wet? Most Christmas cactus problems are water related. Itâ€™s possible that your cactus had too much water. Hopefully it doesnâ€™t have stem or root rot which can also cause stem sections to fall off. Check at the base of the stems, if they are soft and mushy, then you have root rot, if not then let your plant recover on its own and reduce the soil moisture. During flowering keep the plant moist but not wet. Once it is done blooming keep it drier during the winter months. I have a Christmas Cactus and it looks really healthy apart from it’s covered in little black flies. They look like fruit flies and are driving me bonkers…. Any suggestions? It’s possible that you have fungus gnats which live in moist soil and feed on decaying material. Let the soil dry between waterings. I have a Christmas cactus that belonged to my mother. It is probably over 30 years old. I leave it outside on a water system when we go out of town in warm weather. This time, I returned to find the entire plant gone. There are a few leaves in the pot, but all of the rest are gone down to the woody stems. There are nibbled-looking spots on the stems. A few tiny leaves are sprouting, and a couple of the ones that fell into the pot have taken root. I suspect the deer ate it. We never had deer here before, but I have seen some come over since they cleared land nearby. I’ve brought the plant inside now that I’m home to water it. Do you think I should fertilize it to help it recover? I had that same problem. Deer ate it down to the stumps. Going into winter (low light and low humidity) is not the best time to fertilize but I would give it a 1/2 dose of fertilizer just to get it going. Be careful not to keep it too wet in the winter months. Hopefully, it will recover and put on some new growth. Good luck. thank you 🙂 i needed someone to remind me to test the soil ph. it was 7, no wonder theyre turning pink. i had assumed (shame on me) that i had fertilized enough and that the rain water was replenishing the soil. lol, i love my cactus no matter what color it is but red is my favorite and im glad to know that with my attention on it now that the red will be back. thank you again and i love this site. i have a pot of red thanksgiving cactus that i bought in 07. he was red, he was red in 08, he is now melony pink! i live in NW ohio and had all my cactus outside and they loved it. we got a very cool end of august and beginning of september and they set bud. i didnt discover that until i was several days into acclimating them to the house (so far no bud drop) so i continued. well now we have 80s days and nearly 70s nights. i have seen cool temps turn my white to pastel pink, could the warmth turn my red to the melon color? they were fertilized 1-2 times a month alternating between standard houseplant formula and root/bloom booster. do growers somehow chemically manipulate colors that fade later? Color changes can be due to several factors such as temperature, soil ph, light and genetics. To get certain colors, hybridizer combine one color gene with another. One gene may be dominant and as the plants get older, the dominant gene can take over the weaker gene (red) and revert to its original color. I don’t know if growers chemically manipulate the soil to maintain color. The soil ph can have an effect of color. If the plant is in the same soil for a year or more, the ph can change from the water used and perhaps change the color. Temperature will also change color. I have a 30 year old christmac cactus that is looking reeat except it looks like something is taking bites out of it. I almost exspect a mouse or something. Any suggestions?……Kathy E.
Try spraying your cactus with an animal repellent made of hot peppers. Hi can you tell me what ready made store brand potting soil you recommend. I would not be good at trying to mix it myself. You can mix 1 part peat moss or sand to 3 parts houseplant soil mix to make a well-drained soil. A store bought cactus mix will also work well. I inherited a very large old Christmas Cactus from my mother 35 years ago. It was about twenty years old at the time. I have repotted it successfully twice and it has thrived and bloomed faithfully at Christmas and Easter every year until last year. I yearly withhold all water during the month of October after which time the plant has always budded beautifully for Christmas. A blight or fungus that produces white spots that can be rubbed off suddenly began to appear on the leaves last year. First on only a couple of branches and then spread to one entire side. Since leaves were dying I sadly amputated all the large branches on one side and began spraying with a fungus liquid and wiping the white spots off with a rag dipped in the liquid. This helps for awhile but the spots are contining to come back. What can I do to get rid the plant of this disease once and for all? Are the spots bumpy or flat more like a powder? If the spots can be wiped off, it may be that you have scale-an insect or it may be powdery mildew caused by a fungus. By reading through the posts I have come to the conclusion that I sunburned my 10 year old Christmas cactus today. I would say about 1/4th of the leaves are white. Some are translucent. I put it outside 2 days ago, thinking cactus = desert, which I have now learned is completely wrong. It was wilting and the sunlight did seem to help it perk up. But the temperature reached 96 degrees today, and I wasn’t home to bring it inside. When I got home I saw the white leaves and immediately searched for what I did to it. I did soak the soil until water drained out the bottom of the pot. What can I do now? Nothing you can do for sun scald-the damage is done. The white areas will eventually turn brown and die. Keep it in a shaded area until it slowly acclimates to brighter light. Be sure to let the soil dry slightly between waterings. My very old Christmas cactus has just started to have it “leaves” turn white. Any sugestions as to what is causing this and a possable cure? Thanks. One thing that cause chlorotic leaves is a micronutrient defieciency. The stems can also “turn white” from overexposure to sun causing sunscald on the leaves. Is the plant exposed to direct sun? Are the leaves gray and wilted? I have my grandmother’s Christmas cactus which I assume to be 60 to 80 years old. It has been in the same NW facing window for over 8 years. It has not been repotted in at least 10 years. Stems are woody and about an inch thick. Growth is over three feet all the way around. It blooms twice every year, around Christmas and around Easter. New growth appears in late spring or early summer. Occasionally there are dead sections but they are localized. In the colder months, the house is kept in the low to mid 60’s. I give it a pot of water every two weeks and a dropper full of fertilizer each time. Every once in a while I turn the plant. Obviously, the plant seems to be doing consistently well. My question is, should I mess with a good thing? Should I cut back on the watering in the fall and winter? Should I not be fertilizing it every time I water, all year long? Should I repot it even though it is likely I will break some parts of the plant in the process? Wow! I say, leave well enough alone. There are alway exceptions to the rules and obviously your plant is one of them – happy and healthy. Take some cuttings (after bloom) in the spring and make new plants to share with your friends. I have a white Christmas cactus that has turned pink. Is there a way to get it to bloom white again? Christmas cactus can change color due to light, temperature, nutrients and soil ph. Some color genes are weaker than others and flowers will revert to the weaker gene color. I need help. I have a Christmas cactus (or part of one) that has been passed from generation to generation. The one I have has not grown or flowered since we got it about two years ago. In fact I think we are killing it…HELP! We water it about once a week, and use Jobe fertilizer spikes for flower plants every time we water…What are we doing wrong. It sounds like you are killing it with kindness. Reduce the watering, in fact during winter, let the plant dry out a bit-perhaps watering it once a month until you see some new growth sprout. They like a dry,dormant period during the winter. Stop fertilizing until new growth begins. Plants can only utilize fertilizer when they are actively growing. Question on Christmas Cactus: Saw you comment about “White Flies” but the insect on mine is tiny black flies – what can I do? The tiny black flies are most likely fungus gnats. Are they coming out of the soil? If so, you are keeping the soil too wet. Cut down on the amount of watering especially if your Christmas cactus is done blooming. I inherited a Christmas (Thanksgiving) Cactus from a coworker, and due to the placement of my office, it gets NO sun. At all. Just office lights. It bloomed fine last year and this year, but I don’t think it’s grown at all, I don’t think I’ve ever seen a new leaf on there. Some of the end sections have a red hue to them, as well, or red edges. How can I get this to grow bigger and lose that red, if it’s a problem? If the Christmas cactus seems healthy then if may just be a mineral deficiency. In the spring, when the plant starts to show signs of new growth, feed the plant with a well balanced houseplant fertilizer that contains micronutrients. The plant will grow, if you provide a better growing environment. If I manage to find one, what is the first thing I should do for it? Don’t give up just yet. I don’t think removing the branches would help. The problem may be in the roots and (if possible) need time to recover. Keep your cactus dry (just a little bit of water periodically) for the winter and see if it sends out new growth in early spring. They can look pretty sad during this time. At this point you have nothing to loose. If you get a new cactus and it is not in bloom, water little and let it go dormant for the winter. When the top half of the soil feels dry and the pot is light water again. The leaves may be slightly wrinkled but will perk up in spring. Keep it in a sunny window. They can have direct sun for an hour in the winter, otherwise bright filtered light is best. Once the days get longer, they will repsond with new growth, start watering more often, letting the soil dry between watering. Frequency of watering will depend on temperature, humidity, how much light the plant gets. If it is growing quickly then it will need to be watered more often because it is using more water. Also feed the plant with 1/2 strength houseplant fertilizer every 2-3 weeks when new growth starts. Hi. My Christmas Cactus (over 10 years old) which had been thriving has suddenly started acting weird. The branches of the plant have fallen completely off. One is only holding on by a thread, but has still managed to produce a large bud while in this condition. The ends of these branches turned a brown which seemed to be spreading up from the bottom. We have tried loosening the soil, cleaning the pot, and tried propagating some of the plant (maybe we did it wrong, as they did not make it), but nothing has helped. Is my cactus doomed, or is there hope? I don’t want the poor thing to die! From you description, your Christmas cactus has a type of stem rot caused by either a fungus (Fusarium oxysporum)basal stem rot or a bacteria (Erwinia spp.). Both start at the soil line and work their way up and cause the stems to drop off. They will eventually kill the plant. Are the stems soft & mushy? Do they have sunken discolored spots on the stem? Remove any diseased parts and reduce watering. Try taking cuttings again. I have a 3 year old plant. It now has buds but the leaves have places that i can only describe as looking like someone used their fingernail to scratch into the leave. It is not edema as it is not brown..just part of the top layer is gone. this is all over the plant. I do not see any signs of pests that are visible. Any idea what this could be? Is it possible that the plant was exposed to too much direct sun at some point? In response to question on my 3 yr old plantâ€¦it has been on my dining table which gets light from a SE facing window. Has not had direct sunlight to receive a burn. Do not even put them out on the patio in the summer anymore as i had one totally eaten by something a few years back! Is there anyway to post a picture? After viewing the pictures , I believe your Christmas cactus has Odema (Edema). It occurs when the soil is warm and damp and the air is cool and damp-overwatering. This causes rapid water movement to the leaves but slow transpiration through the leaves. Some of the cells burst and cause scaring which turn into brown â€œwartyâ€ looking spots. Once the leaves are scared, they will not change. My christmas Cactus was doing great in low 30s temperature, but last night, I think it froze. The plant is still green, but droopy. Is there any hope that I can save it? I thawed it out and put it in a window. Only time will tell how badly it was frozen. It may still perk up and recover. If it starts to get mushy and soft, then its a gonner. Several days ago my Christmas Cactus got left on the porch and was exposed to temps in the low 30s. It is usually kepy between 50-60 degrees. Over the last several days, the smaller leaves and some of the newer growth has begun to wilt. Some of the leaves look ok. Is there a chance for the rest of the plant, or will the wilting spread? Is there anything I can do for the parts that still appear healty? New growth is more susceptible to cold damage than mature growth. If the new growth hasnâ€™t recovered or perked up by spring time, cut back the spindly growth (up to two segments) which will encourage your plant to send out new growth and make a fuller plant. Because the leaves are wilted you may have a tendency to water but be sure to keep the plant on the dry side during its dormant period (6weeks from blooming) otherwise you can cause root rot problems. I had my Christmas cactus on my front porch and I was away visiting a sick friend in the hospital I had told my husband to bring it inside because there was going to be a cool snap. When I got home it was 21 degrees and he had forgot my cactus, it now has got real droopy and looks dark green I suppose it froze is there anything I can do to save it. It was in full bloom. Sorry to hear that. Nothing you can do. If the leaves get soft and mushy then they were frozen. Please help! My Christmas cactus has reddish/purplish margins around all the leaves and blotchy red/purple patches on the leaf surfaces. I think I overwatered it for a while last summer. One post made it sound like this is a virus and there is no hope to save the plant. Is that true? Is there any way to get the leaves green again? The plant is several years old and all but the first and second segment nearest the root have the red rims. It may not be a virus, but a nutrient deficiency(Phosphorous) or a combination of several problems. You don’t mention if you fertilized during the growing season. You may have some root rot from overwatering and the plant needs time to recover. I’m not sure your plant can be saved but what I would do is transplant it into fresh soil,(eventhough spring is a better time to transplant) water it and then let it go dormant by keeping it on the dry side, but not letting the soil dry out completely. In late winter,when it shows signs of new growth start watering again. My mom has a Christmas cactus that is about 15 years old. I have read the other posts and cannot tell which problem (or which combination) affects my plant. I would appreciate any advice you could provide. It sounds as if your Christmas cactus has symptoms of root or crown rot. Usually caused by excess water. For starters, I believe the problem is in the soil. I’m not a fan of this type of soil mix. Moisture control potting soil retains water keeping the roots wet longer which leads to problems such as root or crown rot. I only used moisture control soil in outdoor containers with good drainage. Eventhough spring is the best time to repot, your cactus may need to be replanted now, provided it isn’t setting buds or blooming. Plant it in a good succulent soil that drains well. Water it and then let the soil dry. Keep it mostly dry during the winter as they need a dry dormant period. It may not survive either; transplant shock nor the moisture control soil. So you’ll have to decide. Cuttings root easily in May-June. Try rooting them in moist perlite. Place the pot in a plastic bag in warm, indirect sun. It may take longer to root this time of year. Good luck. Hope this helps a bit. Hi, Kris! I have been following your site for awhile now and today just confused me. Not that you are wrong because I do not know anything about the “Zygos” but last year I was given what must be a Thanksgiving cactus because it is now budding and blooming all over. My quandary is that I did not do anything special with it. I do live up in the mountains and it never gets very hot so that was a plus. I have used regular house plant fertilizer but other wise just kinda left it alone. IIt has blossoms about 2/12″ long in a white (I was told it would be (cream) but I like the white much better I think. Tomorrow I was going to move it into the living room for the center piece at noon meal. I am afraid now that if I take it in there it will drop all its buds and blossoms. What is your advice in this unusual circumstance. It was a novelty to see this article today. You may have saved my little pretty. TYIA and I will be looking forward for your reply. You can carefully move your Christmas cactus as a centerpiece, after all it should be enjoyed in all its glory when in bloom. The reason I mentioned avoid moving it is when the buds starts to set, they orientate to a light source and moving the plant may force them to redirect causing the buds to “break off”. This is not a major factor in bud drop but its a possibility. Another factor is when moving it to a different location there may be a change in temperature/light which they may not like. Once the plant is in full bloom it should be able to tolerate a little change. Christmas cactus will also set buds without 13 hrs of darkness as long as they get a temperature range of 55-60F for six weeks. Sorry about the confusing, hope this clarifies it. Its been about over a week or so since I posted about the pink bumps on my cactus. They haven’t grown any bigger. I put the plant on a brighter location and spray it every morning, just the foliage. It takes a while for the buds to develop but if you don’t see any change in the buds then there may be a problem with the plant. Make sure it has enough humidity but don’t bother spraying the plant. If you need to increase humidity, place your plant on a pebble tray filled w/ water, this should increase the humidity around the plant. In addition, keep the plant away from any cold drafts or heating vents. I have had 2 cacti for years with no problems. They spend the summers on the front porch with a southern exposure – bright light and little sun. In order to get mine to bloom, I leave them outside until a freeze is predicted, then bring them into the cooler part of the house. By then they have flower buds forming. The longer they stay cool, the longer the bloom lasts. I don’t worry about extended hours of darkness. It seems that by leaving them outside as long as possible, and then bringing them inside, it creates a ‘hothouse-type’ environment which forces it to eventually bloom. Mine have never failed to bloom. I guess I’m pretty lucky with this after reading everyone else’s misfortunes. Mine are 10+ years old. I’ve taken numerous cuttings through the years for friends. Actually, I think I have a Thanksgiving Cactus as it is already blooming. My question is: What do I do about the blooms? Do they fall off on their own or do I have to pinch them off when they are finished? Also, my cactus seems to do quite well so far by being very dry? Should I water more to make sure it continues to thrive? I have a Christmas Cactus that I transplanted to larger pot in May outside; live in Southern Cal. It is now blooming in July. Why? I thought they bloomed in December. Bloom time can be manipulated with some plants. In order to set bud Christmas cactus needs 13 hrs of uninterrupted darkness at night OR a temperature range of 55 at night and below 65F during the day for a six week period. Perhaps you fulfilled that requirement and that’s why its blooming in July. It appears I have a unique issue with my Christmas cactus. It has roots growing from each “joint” between sections all the way up the leaf branches. There are no distinguished “stems”. The leaves have become even more purple than they were. I just purchased the plant this year so it’s young, I potted it with potting soil, however the pot may have been too small. I put mulch in the bottom for drainage. I just re-potted now. The soil was very loose and damp, not soggy. There didn’t seem to be any roots to this plant under the soil. They didn’t appear to be overcrowded at all. Very odd, it’s almost as if I planted this plant upside down! 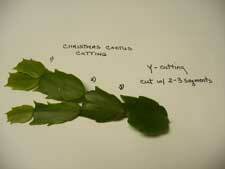 Christmas cactus will send out rootlets between the leaf branches. They are aerial roots that an ephiphyte uses to collect moisture from the air. These can be cut off and propagated for new plants. Purple leaves can be a sign of a trace mineral deficiency but it also sounds as if the roots were not growing well.-probably some root rot going on. So you did good by transplanting it into new soil. The new fresh well-drained soil should help with the trace mineral problem and the plant should root better. Be sure not to overwater the plant. We can’t remember how many years ago we re-potted our huge 50+ yr old Christmas Cactus. It looks a little limp. It is already in a large pot and we would prefer not to go larger as it is already a challenge to move inside or out as the seasons change. Do you have any pruning advice or advice that would help prevent the plant from getting root bound in it’s current size pot? Can you prune roots? Would you control the branch length by pruning them by say half their length? You can prune off some of the new growth up to two segments. It’s best to do this after bloom in spring . Root pruning is a more drastic measure and with a 50+ yr old plant can be risky. Try topdressing-this is a process of removing the top 1 or 2 inches of surface soil and replacing it with a fresh light soil mix. I have my grandmother’s Christmas Catus. It is 50+ years old. I’ve had it for about 3 years – it has neither flowered or shown any growth. This Spring I put it outside for the first time – the leaves turned yellow and branches fell off. I believe that was from too much sun. I moved the plant into my screened in porch – repotted it and now it’s “stable” but not doing anything. What’s left is very woody branches about 6-8 inches long. It used to be huge. Is there anyway to save this plant – it means so much to me. Check the woody branches – are the soft and spongy? If they are firm, then they are mature stems that developed over time. Since you’ve had it for 3 yrs and it hasn’t shown any growth, then I suspect there is a root rot or dieback problem caused by either a bacteria or fungus. These can develop from keeping the plant to moist. An older plant is more susceptible to disease attack. If the stems are soft, dig up a section, check the roots. They may be dark , mushy and very sparse. There is no cure so try to save part of the plant by propagating it. Cut above the rotting portion to be sure all decay is removed and try to re-root the section to start a new plant. You can also cut off leaf (cladophylls) sections and re-root them. Plant the newly rooted segments in sterile soil. I wish I had better news for you. some of The leaves on my Christmas Cactus have turned a almost white color and get very limp. It got buds but they did not bloom just fell off. Hope you can help me. If the leaves are chlorotic (whitening) in the center of the plant – it may be due to low soil temperatures during the fall and winter. If the foliage turns a dull gray/green color and wilts, then you may have a pythium rot (stem rot) which will cause abscission of the stems (stem drop). I have light purplish-red growth on my Christmas Cactus. I have repotted it and checked the roots for root rot – Everything checked out ok. The plant seems healthy and bloomed like crazy this past season. I am wondering if it might be due to too much or lack of insufficient light. A Christmas cactus will develop reddish leaves when it gets too much sun. The purplish color on the leaves can be a sign of a nutrient deficiency such as phosphorous or manganese. When the plant shows signs of new growth, feed your plant with a balanced fertilizer that includes minor elements. I inherited my mother in laws Christmas cactus plant 3 years ago. A piece fell off about two years ago and I rerooted it, later another piece fell off and I rerooted that one. The original one has red blooms and the other two , one has white blooms and the other has pink blooms. They are both from the red one. All are doing beautiful. My question is, why did the other two bloom a white and a pink? Sometimes a plant will send out a sport (mutation), which will produce a different leaf or flower color. A change in flower color can also be caused by growing temperatures, amount of light, nutrients and soil ph. According to Uof I ext. Light and temperature can affect the color of the blooms. Also the weaker gene can revert to the more dominant pink gene. Cooler temperatures can enhance the color. Was curious how you can pollinate a Christmas cactus flower to so that you can produce seeds. Yes, you can pollinate the flower when it starts to bloom and is producing pollen. Take a small brush and transfer the pollen to the pistil(in the center) of the flower. You will know if fertilization took place when the base of the flower starts to swell and form a pod. The pod will mature into a bright pink color 1/2″ long with dark brown to black seeds inside. Some hybrids are sterile. I have an old (20+ years) Christmas cactus. It is large, 3 foot diameter, and has woody stems and is very full. It has been happy, growing and flowering well. I usually put it outside in the rain once in the summer so the leaves can get cleaned from dust and dirt. I put it out this summer and about 2 weeks later the leaves started to fall off in huge sections. It had not been repotted in 10 years, so I repotted it in the recommened soil into a larger pot. It was extremely root bound. It seems happier in the new pot but it is still loosing leaves. The leaves appear green and healthy. I am afraid I will end up with woody stems and no green leaves. Is this just stress or is my cactus just old and dying? It’s more likely to be stress. It’s possible that your cactus had too much water. Hopefully it doesn’t have root rot which can also cause huge sections to fall off. Check at the base of the woody stems, if they are soft and mushy then you have root rot if not then let your plant recover on its own. Take the cuttings(fallen leaves) and root then for new plants. I recieved a part of my husbands Great Grandmother’s Christmas Cactus. His mother told me that she has not been able to get it to bloom for the past couple of years. Every since I recieved my part of the cactus I cannot get it to grow. At first she had it potted in a huge pot, I was told to repot into a smaller pot. I did and I still cannot get the plant to grow. It now has a woody look to the steam area. I have read that you’re supposed to have sand or moss in the mixture. I never did that. I have had this plant for almost 2 years. I am afarid that it’s going to be to late for it. Can I still save it? What can I do to get it to grow and bloom?! We have an easter cactus that has developed a tan coating on the bottom section of each branch. It doesn’t look woody, and it doesn’t look like the pictures we have seen of edema. We have not seen any bugs either. (It has lost some branches lately too, but we changed our watering schedule and that has seemed to help as far as branches falling off.) What could this tan near the base be? Is there something we need to do about it? Check the tan area and see if the stem is still firm, not soft and spongy. If the plant is healthy and firm then it is just maturing tissue, if the plant has soft stems and looks sickly then you may have a fungal canker, fusarium stem rot or fusarium crown rot which shows as decayed, brown dried tissue in the lower trunk or soil line which will eventually kill the plant. All caused by too much moisture. If your plant keeps declining take some cuttings of the healthy parts and start new plants. Watch the watering keep it on the dry side in the winter. New growth is more susceptible to cold damage than mature growth. If the new growth hasn’t recovered or perked up by spring time, cut back the spindly growth (up to two segments) which will encourage your plant to send out new growth and make a fuller plant. Because the leaves are wilted you may have a tendency to water but be sure to keep the plant on the dry side during its dormant period (6weeks from blooming) otherwise you can cause root rot problems. I had my cactus on my front porch and I was away visiting a sick friend in the hospital I had told my husband to bring it inside because there was going to be a cool snap. When I got home it was 21 degrees and he had forgot my cactus, it now has got real droopy and looks dark green I suppose it froze is there anything I can do to save it. It was in full bloom. Is your Christmas cactus outdoors? Whiteflies are difficult insect to get rid of indoors. A safe method is to hang yellow or blue sticky cards on the plant or on stakes to attract and trap the adult population of whiteflies. The sticky cards are available at garden centers. Be sure not to touch it or get it on your clothes. As for the rest of the younger population, spray the plant and soil surface with horticultural oil. Repeat treatment in 7-10 days until you no longer see the insect. Whitefly will spread from plant to plant therefore you should isolate the infested plant. I had deer eat my whole plant leaving only stubs. My Christmas Cactus was started by my mother to me as a wedding gift over 28 years ago. It has developed a white substance at every joint and looks very unhappy. Can I save it? It is also spreading to other cactus. Sounds as if you might have an insect problem. Is the white stuff fluffy and cottony looking? If so, you may have mealy bugs. Look the the mealy bug article. My christmas cactus is in full bud…how long do these buds take to burst open for a full bloom? It seems like I have seen these buds with color peaking out for 2 weeks…I’m anxious for the full bloom! What sometimes happens is that the buds form but for some reason, usually environmental, will sit there dry up or drop and not open. This can happen when the room is too dry (low humidity) and temperatures are too high. To add more humidity around the plant put it in a pebble tray of water and mist the plant. Keep the room temperatures around 65-70 F. Keep away from heating vents or cold drafts. Once they set bud the plant does not like to be moved. Are these plants safe if pets or small children eat them? Christmas cactus are listed as non-toxic or having a low toxicity level when ingested in small quantities. If large quantities are eaten then it can cause vomiting, diarrhea and mental depression. How long should a christmas cactus be kept in the dark to help it bloom? I have it in a totally dark closet where it is cool. Its been in the closet about a month and a half. I don’t take it out of the closet at all. Christmas cactus need about 14 hrs of darkness and cooler temperatures. The stimulus that makes them bloom is short days and long nights. They still need filtered sunlight during the day, so you really do need to bring your plant out of the closet during the day. Hi – thank goodness someone seems to be a Christmas Cactus expert. I too have one of sentimental value. It is about 10 years old – has been repotted a few times over the years. Always been indoors. This summer, I put outside under a porch umbrella. After a month or two, I noticed the ends very flat and starting to turn purple. I repotted – brought back indoors to it’s regular spot and clipped off some of the purple brackets. Now more are purple/green and it doesn’t seem to be firming up. Tell me what I need to do and what I did wrong. The purple leaves sound like a mineral deficiency. It may need a fertilizer that supplies both major nutrients as well as trace minerals. Fall is the time of year when you cut back on fertilizing but in your case, I would give it one light dose 1/4 strenght of a well-balanced soluble fertilizer to satiate this hungry plant. After blooming, let it go dormant (no fertilizer) and start feeding monthly with 1/4 strength fertilizer when new growth starts in the early spring continuing through early fall. I rescued a christmas cactus about 4 years ago. I had no idea how to care for it and I am still having problems with it. I have my house temp set around 65F all day long. The plant is sitting in indirect sunlight on the south side of the house. It gets watered only when it’s soil is very dry. 4-5 months ago one of my cats tipped it off the shelf and fell 4-5 ft to the floor. 2-3 segements were broken off close to the roots and now from those spots there is 2-3 in of new growth starting. I am really happy about this but I just can’t seem to get this plant to bloom no matter what I do. I have also subjected it to closet life for weeks and let it dry out too. What can I do? The major factor in getting a Christmas cactus to bloom is cool temperatures and long nights. They bloom when the days get shorter and nights longer. The temps for flower bud is 55-60 for 6 wks.. In higher temperatures, they can be coaxed to blooming with 13 hrs. of uninterrupted darkness. Its best to have a combination of both. Set the plant outdoor in a shady area over the summer and bring it in the fall as the weather gets cooler and days are shorter. It should work. My christmas cactus is heathy looking and still blooms. I have been getting these purplish blister/bumps on the leaves lately, and then they scab up when they age. What is this? A bug I hope not… Help!!! It’s possible that you may be watering your Christmas cactus too much. The bumps which eventually turn into a brown corky growth may be a sign of edema . This environmental condition happens when the plant is overwatered. The water moves rapidly up to the leaves but the plant can’t transpire it fast enough causing the cells to burst. The broken cells heal over and develop corky brown spots. Keep it on the dry side and be sure it has adequate drainage. My Christmas Catcus has bloomed every year since I have had it but it does not look healthy because the leaves have turned reddish. Is there some way to correct this or should I just not worry? Leaves that are turning pinkish/red and are wilted can be a sign of rot. Carefully, knock the plant out of the pot and check the base of the stems. Are they soft and mushy? If so, there is some rot there. Cut the decay back to healthy firm tissue and repot. Keep it on the dry side during the winter.Reddish leaves can also be the result of too much sun. Can a christmas cactus be planted in a self watering pot. I just bought one a couple of weeks ogo. the leaves are looking a little wilted in the self watering pot? Good question. They like it on the dry side during the winter and moist,well drained soil in the summer. Since they are a tropical epiphytes that hang under trees in the jungle, they would get their water briefly from the rain and then dry up. I would think a well-drained potting soil would be more suitable for your Christmas cactus. HELP!!! My christmas cactus was full of buds and now after moving it inside the sections are dropping off. #-4 joint sections with clean breaks at the joints. Can this be from not enough light? It may be stress related-a change in the environment, too much water, dry heat can cause leaf drop. Keep it away from heating vents or cold drafts. Check the base of the stem to see if it is soft and “mushy” that can indicate a root rot, in which case only new cuttings will save the plant. If there is no root rot wait till spring, it may send out new shoots. Be sure not to overwater as they like it dry in the winter. Can I delay the blooming of my cactus by placing it in a dark closet. The buds have already formed. Am I too late? It is too late, once the buds have formed its too late. Bud formantion starts when days get shorter and nights are cooler. Many “Christmas Cactii” are really Thanksgiving cactii which bloom around Thanksgiving. You can slow down bloom by keeping the plant in cooler temperatures. My christmas cactus has wrinkled leaves.How do I know if it’s too dry or over watered??? Christmas cactus (somewhat of a misnomer)is an ephiphyte-a tropical plant that likes to grow in humid jungles. It is not as tolerant of drought conditions as the typical desert cactus. It will wilt (wrinkle) under drought conditions. You are probably underwatering it. Water when the top 1inch of the soil feels dry. During the summer, water so that the soil is continuously moist but not wet. Let the water drain out from the bottom of the pot. Water less in the fall and winter.